The basketball gods have been unkind to us of late. RJ Barrett was dealing with a stomach issue but still played 36 minutes (he usually plays 40/40). Zion Williamson out with the knee sprain. Cam Reddish injured mid-game and didn’t look the same but still grinded on. Same with both Marques Bolden and Javin DeLaurier. That sounds so fun, doesn’t it? Duke fell to Virginia Tech for the second loss in three games on Tuesday. Hats off to Virginia Tech– they played very well and we didn’t. RJ Barrett saw 2 to 3 defenders at almost every touch, under the weather in the first place, and the defense is still imperfect without Zion. RJ, Cam, and Marques Bolden combined for 52 but it wasn’t enough. If there was one glaring issue on defense it was the strong side corner. That’s a spot you just don’t leave open, and it was left often when the ball went inside to a very strong big man in Kerry Blackshear. Cam Reddish said that they “weren’t rotating fast enough” and Coach K spoke similarly. 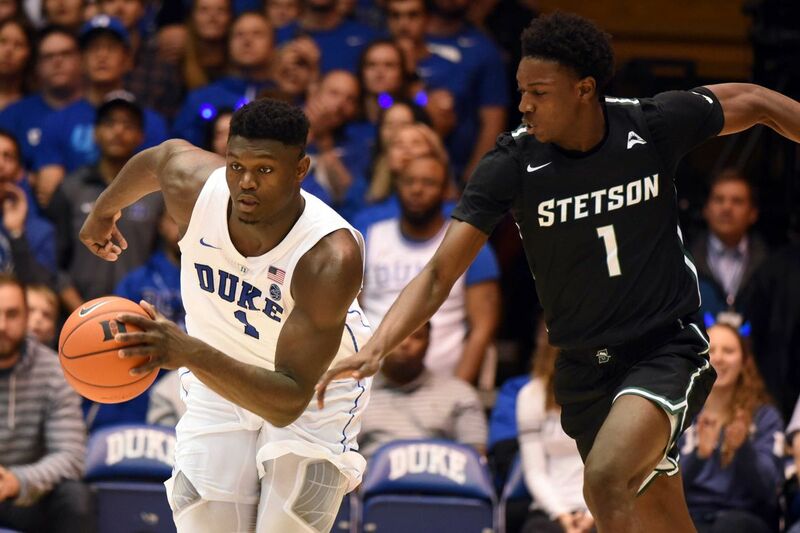 The defense in general is an area of focus in the absence of Zion Williamson whose return is still unclear; he is yet to be upgraded from day-to-day. Bleed blue. It doesn’t feel good, but a this rough 6-game stretch, especially with half of those played without Zion, is over. We have Miami on Saturday. Since November, when Duke shocked Kentucky at a score of 118-84, all the talk has been centered around two players whose play is difficult to believe. RJ Barrett can score from just about anywhere. Zion Williamson is a 285-pound monster who dances around the rim like a ballerina. Both are humble and unselfish; they’ll dive to the floor for loose balls and they’ll make the extra pass to an open teammate for a shot. But the difference for this team? These two aren’t a team by themselves. RJ Barrett and Zion Williamson will, if all goes well, lift Duke to new heights this season, alongside Cam Reddish, the overlooked star. On the other hand, who will keep us grounded? Who will lead the way, not statistically, but emotionally? Think Quinn Cook in 2015. Those freshmen, Jahlil Okafor, Justise Winslow, and Tyus Jones, didn’t win a championship by themselves. So many people have said this: Duke is young. Which is true. Heck, we start four freshmen and a junior. But the veterans are very underrated. Jack White and Javin DeLaurier, co-captains, have been the facilitators for Duke. They’re two of the best teammates you’ll find in the NCAA. They’re good friends; brought together by Duke Basketball despite growing up 16,069 miles apart. Now, they’re faced with one task: getting this young team through the season and to the ultimate goal: a national championship. Bleed blue. We’ll be back soon to preview Duke’s first game after exams against Princeton. Duke will get one last test before taking a week-long break (okay, well, one last basketball test) for exams as Yale visits in the “Brain Bowl”: these two universities are some of the premiers of the country. It’s also a rematch of the 2016 Round of 32 matchup. Duke won, 71-64, but the Bulldogs didn’t make it easy and will not this time around, either. Yale is actually very good this year and Duke can’t sleep on them. The old Ivy League that just couldn’t keep up is dead and gone. Yale has already taken on and defeated an ACC foe in Miami– away from home, at that– a week ago. They lost to Vermont and Memphis but kept it pretty tight in both games. Hartford certainly gave us a headache with grit, experience, and three-point shooting. Yale is no different. In fact, they’re ranked 18th in the country in three-point percentage. With a stout interior defense, it’ll be the outside that Duke will need to focus on to keep the Bulldogs from staying in it. Despite a sloppier first half and a persistent, experienced opponent, Duke flexed its muscles and got it going, later on, to pull it out against Hartford, 84-34. Hartford was not going away and stayed in it, with the lead for Duke at just eight points with 12 minutes to go. It was about then that Duke got a sudden burst of momentum, with multiple successful transitional scores in a row. Cameron came alive and the dunk show was on. RJ Barrett led all scoring and rebounding with an impressive 27 and 15 line, with Zion just behind at 18 and 12. Javin DeLaurier had a good game with 10 points, as well as Tre Jones with 10 and 6 assists. Between that point and the end of the game, Duke scored 37 to Hartford’s 15 to pull it out. It was almost never pretty: Coach K was slamming chairs to the ground at the start of the first half to get his team’s attention. About 1:30 into the first half, with Hartford pulling from the halftime’s lead of 9 to under 5 when Coach K called a timeout to get some energy back into his team. But soon, the only things being slammed were basketballs as the later minutes of the game were a clinic on dunking. I’m not sure whether RJ and Zion will be praised or punished in practice for that off-the-backboard dunk (it was unselfish, as he could have taken it to the house himself) but it was on SportsCenter alright and was fun to watch..
Bleed blue. Duke returns for a tough contest with Yale on Saturday before taking a break for exams. A brilliant first half. A hard-playing team that made just about every Duke fan proud. Oh, and, by the way, Zion put on a dunk show. Yeah, this was a pretty fun game. 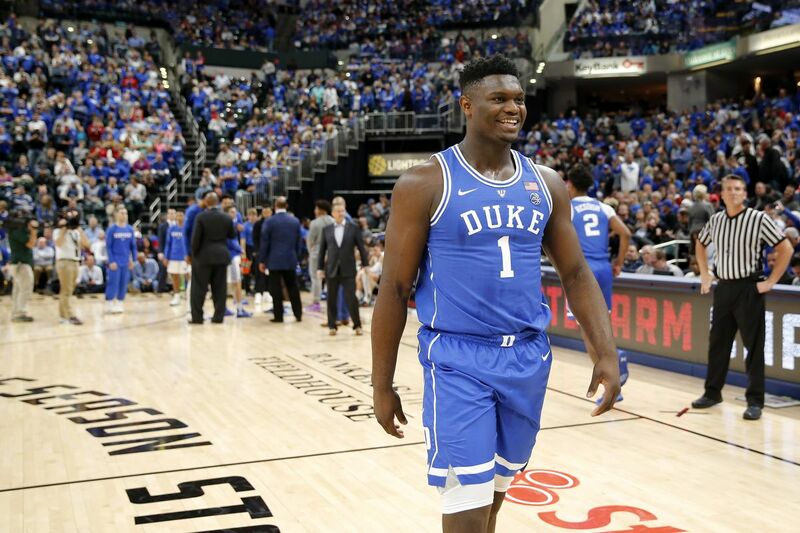 Duke smacked Eastern Michigan 84-46 as Zion Williamson led the way with 21 points and 9 rebounds. RJ Barrett came a close second with 20. Javin DeLaurier had one of his best games in a while, scoring 10 points alongside his 6 rebounds, 2 steals, and block. In addition, a usually foul-prone Javin only had one foul in this entire game, which came in the second half. Jack White also performed well, matching his co-captain with 10 points. Unfortunately, I couldn’t find tape of an amazing lay-in from the second half, but Duke Basketball Report has highlight reels of RJ and Zion, so check those out! Cam Reddish was limited in playing time because of a sore groin, but Coach K said he’s fine and it was just a precaution. He would’ve played had it been closer. Freshman Joey Baker was the only guy on the team not suited up, which basically solidifies the notion that he will redshirt this year. Bleed blue. Duke prepares for San Diego State in Maui this Monday. That’ll be 5pm ET. Go Duke! I must say, I had faith in our squad, sure, but not this much faith! In an unprecedentedly smashing win, Duke embarrassed number-two ranked Kentucky by thirty-four, 118-84. Other than after a few minutes at 11-8, after which a 9-0 run made it 20-8 you kept thinking “it’s got to get close at some point”. It didn’t. People are at loss for words. RJ Barrett scored 33. Zion Williamson scored 28. This is a very clear testament: Duke can score on anybody. Kentucky’s defense has been bad in the past at the beginning of the year, but not just anybody is going to be able to put up 118 on a top-2 team. Strengths: Um, All of Them? I have to say, Duke just about dominated every aspect of this game. There were some foul issues early: Javin DeLaurier, Marques Bolden, and occasionally Zion Williamson were called for fouls but in this game, honestly, sometimes it felt like standing in the lane was a foul. I can’t complain, though. But the strengths abounded: Duke made Kentucky a half-court team, plain and simple. They dominated transition: we scored at will in transition situations. Zion Williamson, RJ Barrett, and Cam Reddish got to demonstrate their games in so many ways. All of them got in the paint, all of them took perimeter shots, all of them got jumpers. Those three are extremely versatile players. And shoutout, Jack White! Jack is willing to do the dirty work behind the scenes that make this team look great. He had an excellent game with 11 rebounds, 3 assists, and 2 steals. He doesn’t score in the 20s and 30s as consistently as some of his teammates might, but he gets it done. RT to show love for @5jackwhite. The kid is HOOPING. I want to note that this will (probably) not happen every game. There will be the UVAs of the world, with their stifling defense. A freshman will have a bad game. But this team is really, really good, and they told the world Tuesday night. Did I mention this? Oh. My. Goodness. This is gonna be one fun season. Duke showed an excellent sense of what #TheBrotherhood means last night. Let’s see how the rest of them reacted. Yooooo these Duke boys are serious!!! @DukeMBB LETS GO DUKE!!! RiP DAD! The fury ran wild today in Cameron Indoor as Duke’s young team absolutely ravaged Ferris State, 132-48, a team that fought hard but failed to contain Zion Williamson and RJ Barrett (and the rest of the Blue Devils), who combined for a total of 55. These youngsters have a special talent for sharing the ball, as they racked up a total of 29 assists and Tre Jones neared triple-double territory with 8 points, 9 rebounds, and 10 assists. Obviously, the stat lines were through the roof. A quick synopsis: RJ Barrett was the high point-scorer with 32, Zion Williamson had 10 rebounds to accompany his 25, and big men Marques Bolden and Antonio Vrankovic picked up 15 and 10 points, respectively. Cam Reddish had 20 points as well to go with his 5 assists and 2 steals. Again: that stat sheet was packed. 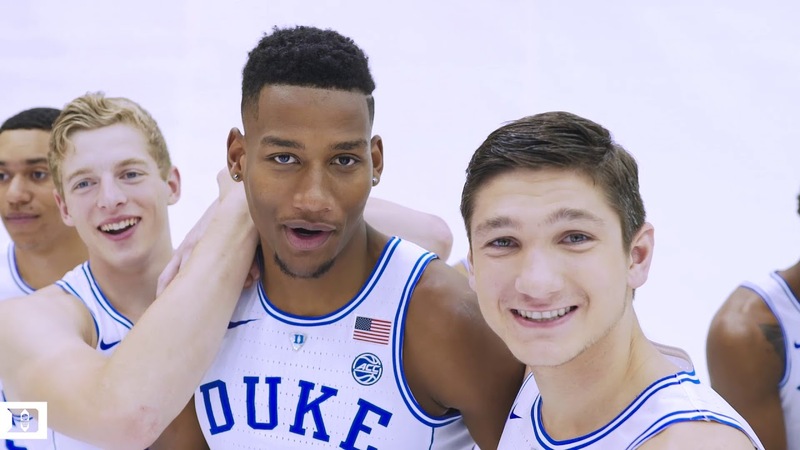 Coach K officially announced two captains and, in my opinion, excellent choices, to lead the 2018-2019 squad: Javin DeLaurier and Jack White. These two guys have shown dedication and heart through the years, and, let’s be honest, they’ve shown dedication and heart to a lot of teammates. Javin and Jack deserve this role; they’re roommates and have emerged as leaders for this group from the very beginning of the year. Congratulations to those two. Bleed blue. 10 days to the Champions’ Classic!